JBL OnBeat review | What Hi-Fi? One would think there wouldn’t be much room left in the dock market, wouldn’t one? It turns out that one would be wrong. 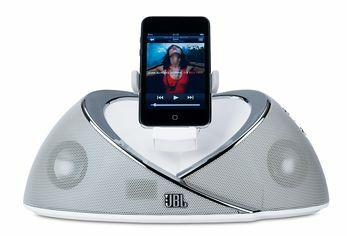 The JBL OnBeat is a compact, smart-looking dock that has the rare ability to accommodate pretty much any modern iDevice you’d care to plug into it. It comes with brackets to hold iPhones and iPods, and also iPads. They all fit snugly, and can be rotated into landscape mode for Cover Flow browsing and video watching. Round the back are a USB socket (which lets you connect the OnBeat to a computer and play your iTunes library through it, and also syncs your iDevice if it’s docked), a 3.5mm input for non-Apple-flavoured music players and a composite output for watching video on a connected telly. On the side are volume up/down buttons, while the remote is your typical plastic credit card-style zapper with basic controls. And the sound? A bit underwhelming. While vocals are reasonably clear and instruments are well organised with simpler material like an Apple Lossless version of Noah and the Whale’s L.I.F.E.G.O.E.S.O.N., play anything more involved – we took a spin down memory lane with Aerosmith’s Love in an Elevator – and things quickly get cluttered. Crank it up and things don’t really improve. The midrange develops a ‘honky’ quality, and treble gets way too abrasive, while organisation gets lost. This would all be mitigated a little if there was a decent amount of bass heft, but that doesn’t exist, either. And that’s pretty hard to swallow when you consider that Logitech’s Award-winning S715i costs £20 less and packs a good deal more oomph. Where the OnBeat claws back some cred is as a kitchen or bedroom video player. Dock an iPad in it and you can use it as an attractive-looking internet TV source – where sound quality doesn’t really matter as much as it does with music. We wanted to like the OnBeat – we really did; it looks nice and is versatile. But the sound quality – its raison d’être – doesn’t do it any favours. Shift its focus to iPad-based video, though, and it could be worth a look.